Posted in People News on September 16, 2015 by Tanya Schoor. 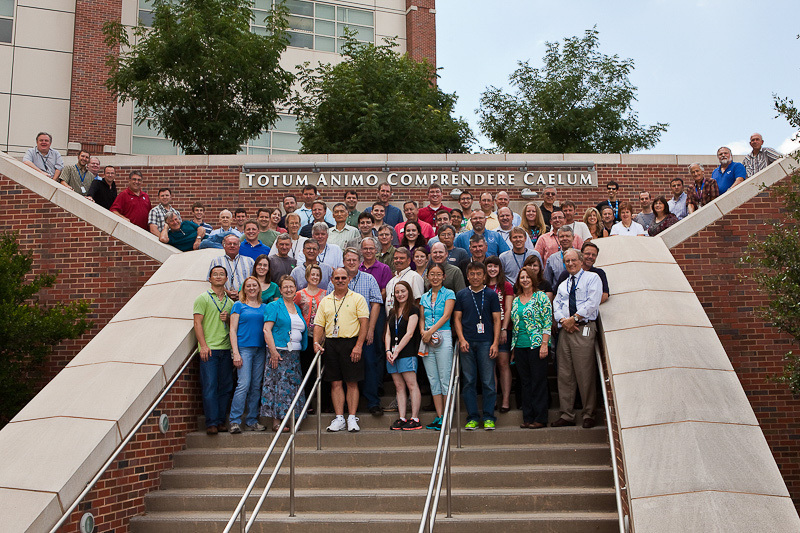 The National Severe Storms Laboratory celebrated its 50th anniversary in December 2014. 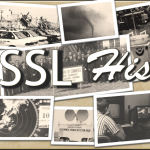 Over the last half century, we have been committed to improving understanding of severe weather and developing tools to assist National Weather Service forecasters. The projects and instruments have changed over the years, but our mission has remained the same. 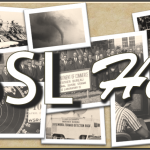 Take a look at how NSSL has evolved: Slide the bar left and right to compare then and now. 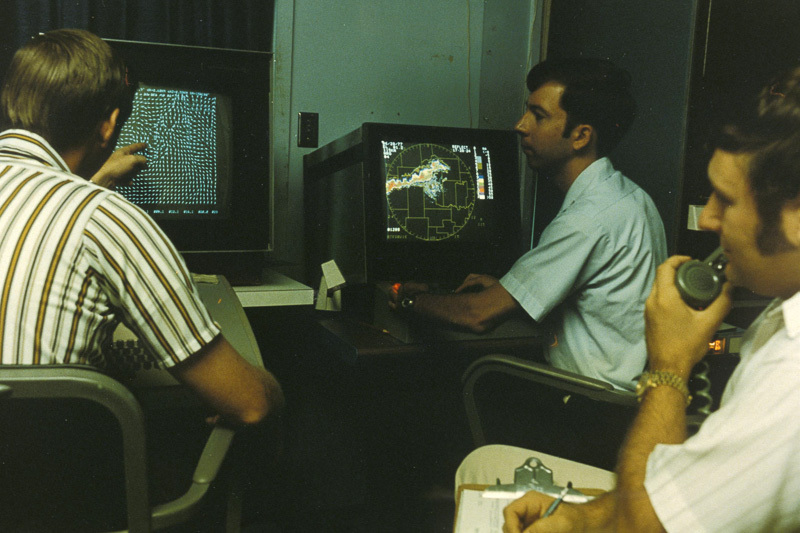 In 1974, the Joint Doppler Operational Project proved the value of using Doppler radar to improve weather forecasting. 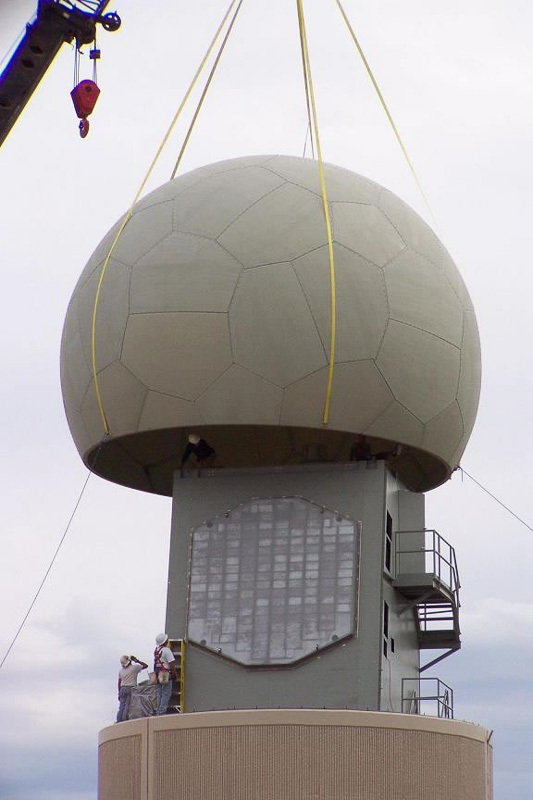 Now, NSSL scientists join forces with forecasters from the National Weather Service in the PARISE experiment to study the possibilities of Phased Array Radar. 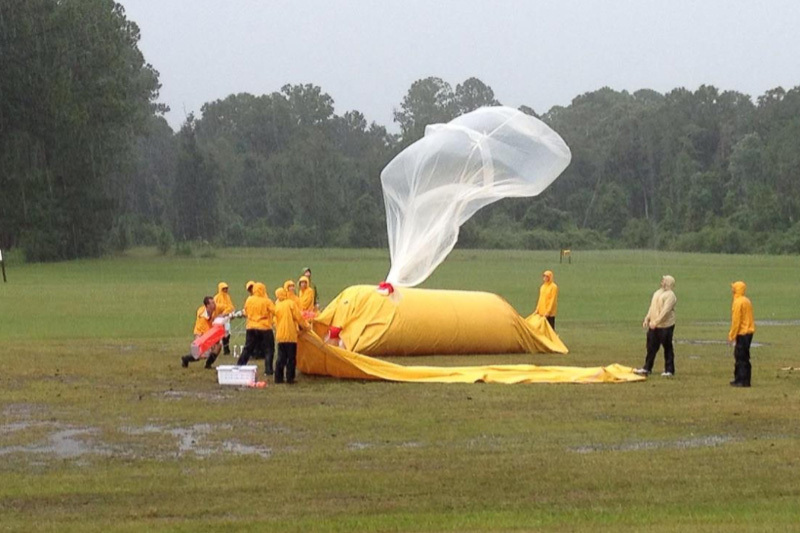 Photo Credit: [Then] Don Devore (NWS), Captain Dave Bonewitz (USAF), and Don Burgess (NSSL). [Now] James Murnan (NSSL). 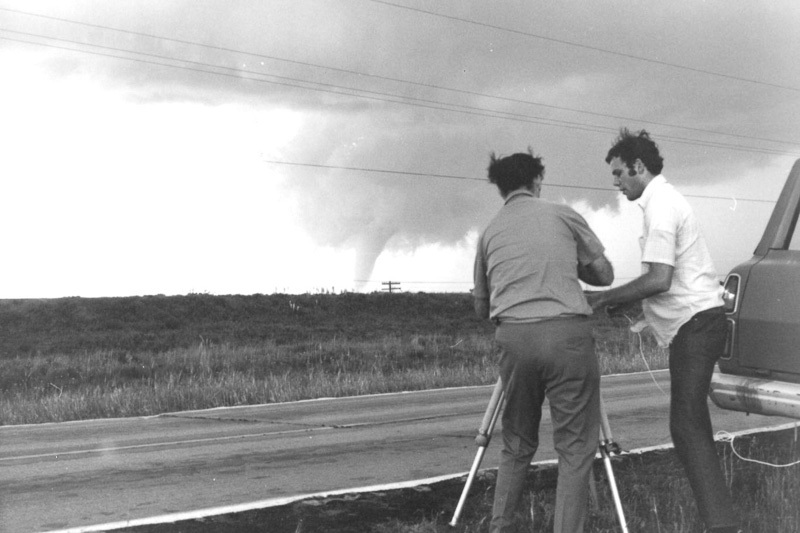 In 1973, the NSSL Storm Intercept project was one of the earliest field experiments. 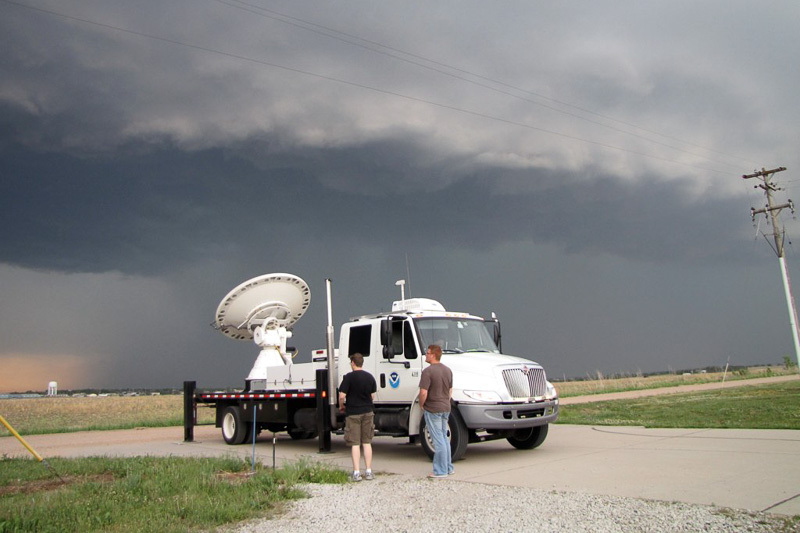 NSSL scientists were guided by Norman Doppler Radar as they tracked the Union City tornado on May 24. Now, field research continues to evolve with more advanced technology and equipment. Photo Credit: [Then] Joe Golden and Dan Purcell. [Now] Unknown. 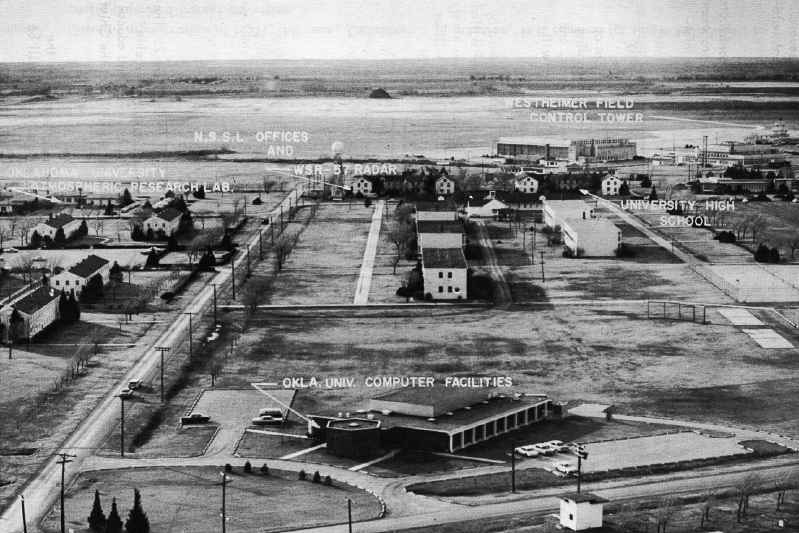 During the 1950s, the U.S. 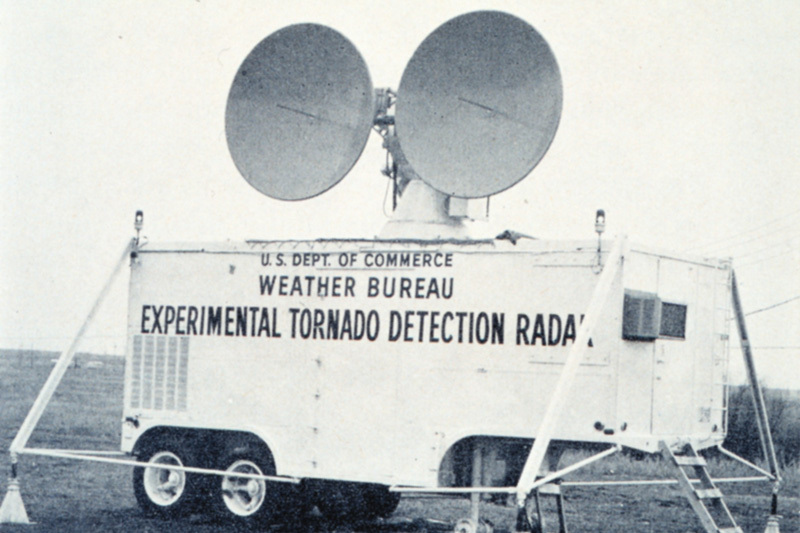 Weather Bureau’s continuous-wave 3-cm Doppler radar with side-by-side transmitting/receiving antenna was used for tornado studies in the southern Plains. 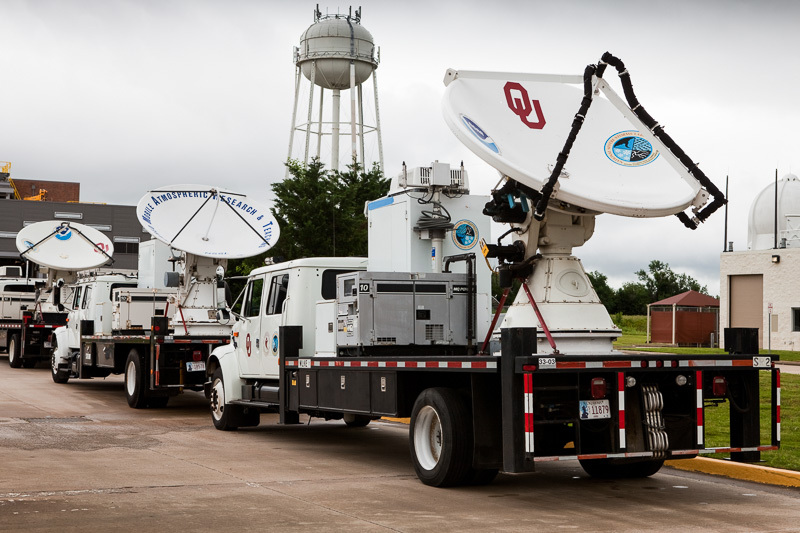 Now, several large mobile radars are deployed in the NSSL PECAN experiment to help analyze nighttime thunderstorms in the Plains. 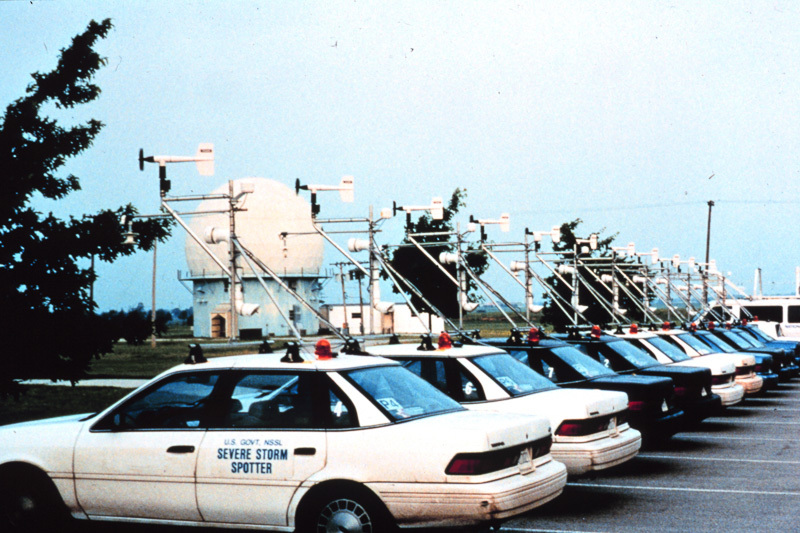 The original fleet of mobile mesonets was prepared for the original VORTEX experiment in 1999. 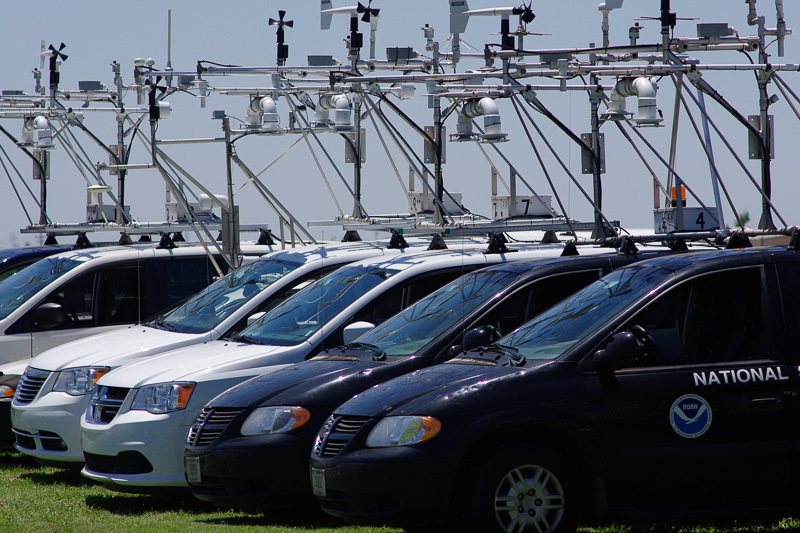 Now, updated mobile mesonets stand at the ready in Hays, Kansas as part of the PECAN experiment. Photo Credit: [Now] Mike Coniglio. 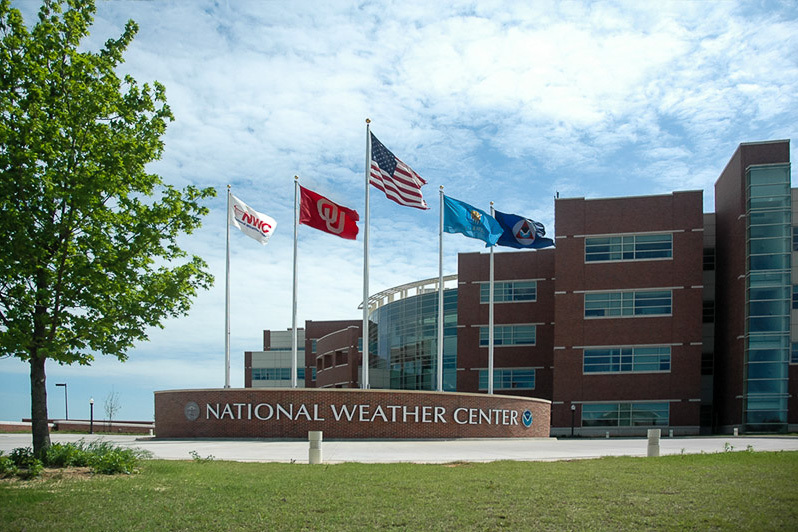 In the early days, NSSL was housed at the University of Oklahoma Research Park in Norman, Oklahoma. 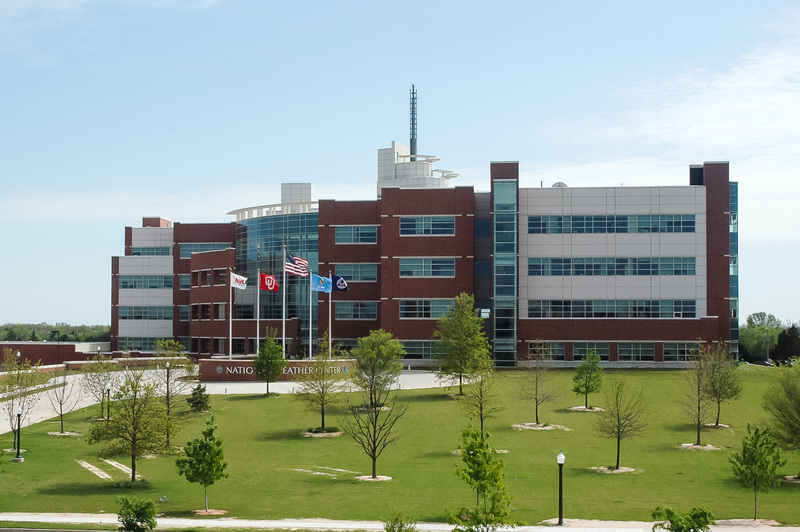 Today, NSSL offices are in the state-of-the-art National Weather Center, which opened its doors in 2006. 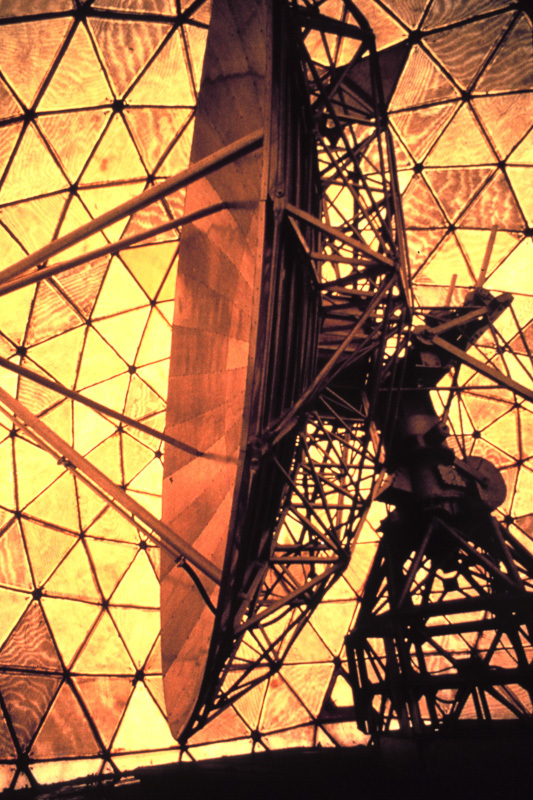 The first Doppler radar became operational in Norman, Oklahoma in 1974. 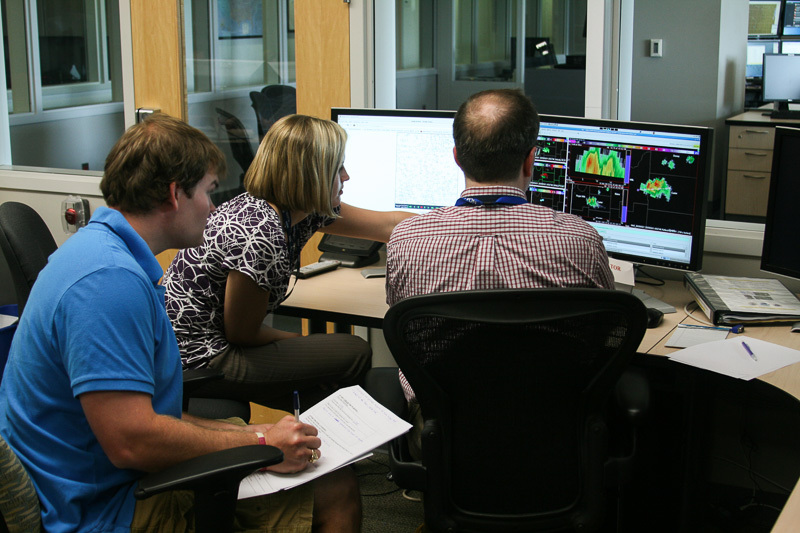 Today, NSSL scientists are exploring the possibilities of Phased-Array Radar for improving weather forecasting. 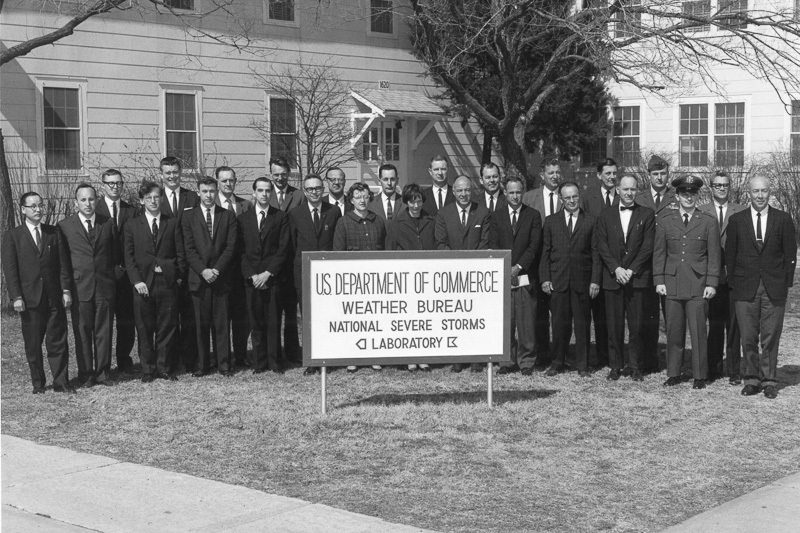 The scientists meeting at NSSL in 1964 looked very different from the group that works here today! 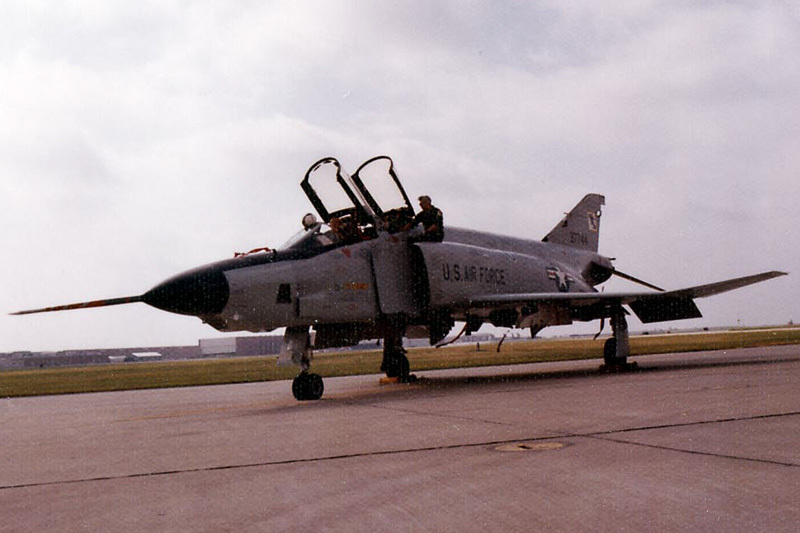 In the 1980s, aircraft flew into thunderstorms for Project Rough Rider, measuring turbulence and leading to improved commercial airline safety guidelines. 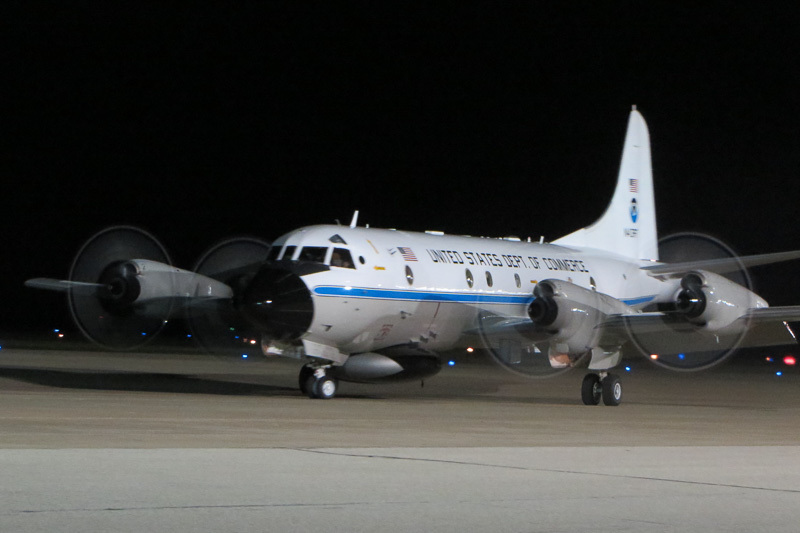 Today, NSSL scientists use the NOAA P-3 aircraft in field experiments to learn more about convective storms. 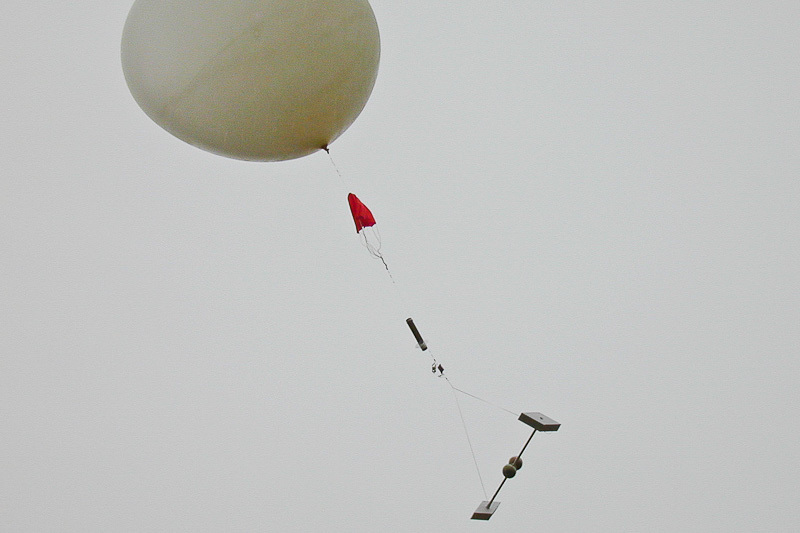 NSSL has launched special research weather balloon systems into thunderstorms to measure conditions inside the storm. 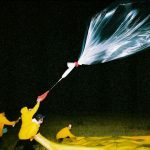 Now, researchers have developed a ballon-borne instrument called the Particle Size Image and Velocity Probe (PASIV), which captures high-definition images of water and ice particles and, along with other instruments, helps us to understand relationships between macro and microphysical properties of thunderstorms. « Significant Paper: A review of the remote sensing of lower tropospheric thermodynamic profiles and its indispensable role for the understanding and the simulation of water and energy cycles.